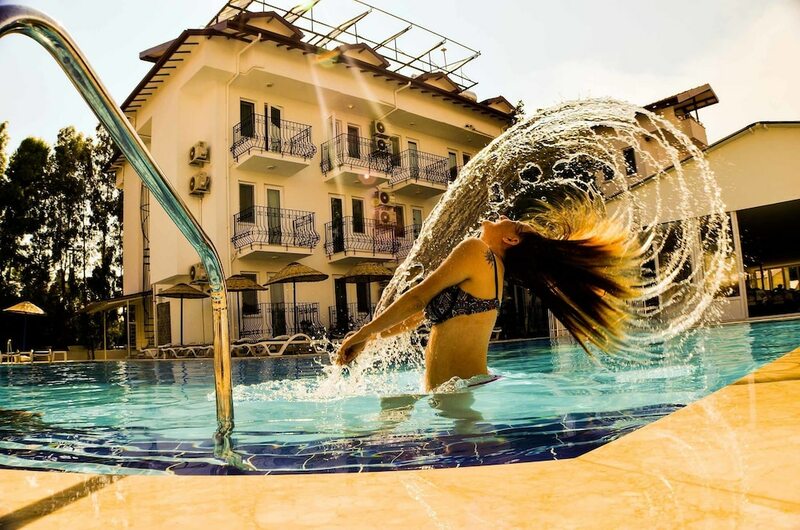 Hotel Seril 2 is in the heart of Fethiye, within a 10-minute walk of Sultan's Aquapark and Calis Beach. This hotel is 10.4 mi (16.7 km) from Oludeniz Beach and 16.1 mi (25.9 km) from Gocek Marina. Make yourself at home in one of the 46 air-conditioned rooms featuring minibars and LED televisions. Rooms have private balconies. Complimentary wireless Internet access keeps you connected, and satellite programming is available for your entertainment. Private bathrooms with showers feature complimentary toiletries and hair dryers. Enjoy recreation amenities such as an outdoor pool or take in the view from a garden. This hotel also features complimentary wireless Internet access, concierge services, and wedding services. Take advantage of the hotel's room service (during limited hours). Mingle with other guests at the complimentary reception, held daily. Quench your thirst with your favorite drink at the bar/lounge. Buffet breakfasts are available daily from 8:00 AM to 10:00 AM for a fee. Featured amenities include express check-in, express check-out, and a 24-hour front desk. A roundtrip airport shuttle is provided for a surcharge (available on request).